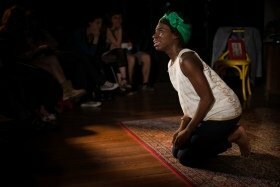 Black is the Color of My Voice is ‘inspired by the life of Nina Simone’, which isn’t quite the same as being a biographically accurate representation of Nina Simone’s life. That said, it’s not quite the life of ‘Mena Bordeaux’ (Apphia Campbell) instead of the life of Simone; there are many similarities between the two, but the separate and distinct Mena character allows for some creative freedom. More than that, it also removes from the equation any sort of analysis with regards to how accurate an impersonation of Nina Simone is seen and heard, and focuses attention instead on the narrative, which, perhaps a tad predictably, had some harrowing moments, particularly as Mena joins the civil rights movement to fight against racial segregation in the United States. There are the headlines from that era that have been mentioned in the plots of shows on the London stage before (Motown The Musical being a case in point) – including the bombing of the 16th Street Baptist Church in Birmingham, Alabama in September 1963, and the assassinations of President John F. Kennedy and the Rev Martin Luther King Jr. Mena (and Nina, for that matter) had begun, with no formal training, to play the piano quite competently at the age of three, something which Mena’s mother, a devout Protestant, took to be evidence of the supernatural, a belief that God had ‘blessed’ Mena with a ‘gift’. And then there was her first concert, when she was still a schoolgirl: her parents were asked, as per the regulations of the venue at that time, to sit in the designated area for non-whites (it is quite possible that another word beginning with ‘n’ was used). Mena was furious, refusing to perform until her parents were allowed to take the front row seats they originally had. In this solo performance, Campbell does well to portray the said parents as well as other people in Mena’s life, including an abusive spouse. There are some songs included in this play, though most of the Nina Simone back catalogue is reserved for Soul Sessions, what Campbell referred to on press night as ‘the second half’. It is quite possible to enjoy Soul Sessions in its own right, without having seen the earlier play, and it is altogether brighter and breezier. And yes, one comes out of the latter show feeling good, so to speak. Reliant on description, there’s some compelling storytelling in ‘the first half’, with the bedroom (or is a hotel room?) transforming – without literally doing so – into any other place that the narrative dictates. The premise of her (re)telling her life story, or at least an abridged version of it, is that she is undergoing an intense self-help initiative, which involves no cigarettes, no alcohol intake, and not even a connected telephone landline. The ultimate aim is to get some closure after the passing of her father. Whether she achieves it is not, alas, something I shall reveal here. The head wrap with which Nina Simone was more often than not seen wearing comes on for Soul Sessions (well, probably not the actual one, you understand), at least for a while. When it comes off, the physical change coincides with a psychological one – here stands Campbell, now telling her own stories about love and living overseas. The Simone standards came out, including ‘I Loves You, Porgy’, ‘Don’t Let Me Be Misunderstood’ and ‘Ain’t Got No (I Got Life)’ with the audience encouraged to sing along if they knew the words. This second show was just as compelling as the first, although the difference in tone and atmosphere could not have been more different. Tim Shaw played the keyboards flawlessly throughout, and there are some intriguing thoughts about how Campbell came to be someone oozing positivity and energy by immersing herself in the music of Nina Simone. How wonderful to see and hear what she has learnt being passed on for others to ponder on. An exciting and entrancing double bill. 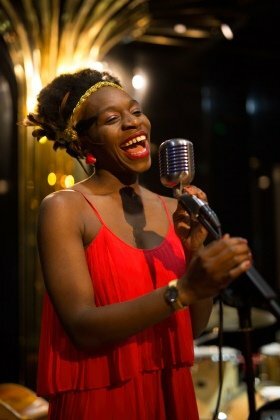 Apphia Campbell’s solo show inspired by the life of Nina Simone comes to London’s Trafalgar Studios for a four-week run with selected performances including a double bill of Black is the Color of My Voice and cabaret show Soul Sessions.